Did you try the link in the dubtrack forum? First time of hearing about lowercase? Pretty appropriate for the music's sound. The longer I listen to that album the better it sounds. Amazing. Last edited by Overcast; 06-25-2016 at 10:37 AM. If my entire high school musical essence were distilled into a single elemental album, that album would be Ruby Vroom. 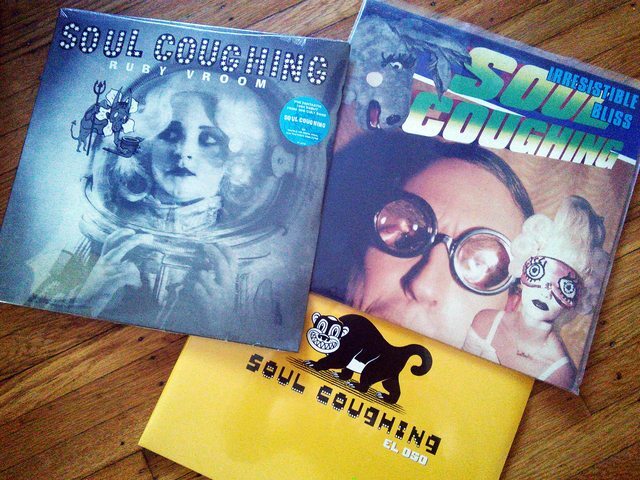 Doughty's "deep slacker jazz" and his Moonlight Meditations poetry broadcasts embody both a streetwise edginess and a sampledelic proficiency which gave rise to its cult status and to the birth of the Soul Coughing Underground. Sadly, after a bitter breakup and Doughty's decision to get clean, he resigned himself in later years to writing formulaic, homogenous coffeehouse pop which is enjoyable only until you realize that he's written the same exact song 30 or 40 times. Sorry Mike, we liked you better on the drugs. And while Doughty is opposed to looking back upon his career with the band, Slash Records was kind enough to issue Ruby Vroom and the rest of the SC catalog on vinyl. I wasted not a moment's hesitation and ordered the entire set the day it was announced. In my mind, it will forever be 1998, in the 5 percent nation of chocolatey delicious. Saw him randomly in Portugal and finally got around to listening to his album. Not bad at all. All the U2 talking I've done today has lead me to a U2 marathon. I'm gonna play algums I've never heard, mostly their early alternative works. I'm playing The Unforgettable Fire right now. It's quite good, but this new sound of there's was perfected in Joshua Tree.